Last November, turnaround artist John Chen took a job that not too many CEOs would have wanted, the top executive post at BlackBerry. Thorsten Heins' short-lived reign as CEO of BlackBerry had just gone down in flames amid a huge write off of unsold BlackBerry Z10 handsets. Without a strong CEO, the company might not survive. Luckily for BlackBerry, John Chen decided to take the job. With the turnaround of Sybase on his resume, Chen had succeeded before under similar conditions. Today, the company reported a smaller loss than expected for its first fiscal quarter, and Chen's plan for turning the company around is taking hold faster than expected. And to top things off, on Thursday we saw Chen holding the two most eagerly awaited Berry handsets since the BlackBerry Storm. When meeting with the media on Thursday, the company put up a slide highlighting some of BlackBerry's capabilities in security. Another slide discussed BES12, which will offer multi-platform support in the MDM space for BlackBerry. Other slides focused on the enterprise version of BBM, and the three BlackBerry models coming out in fiscal year 2015, which is already underway. Displayed were the already released BlackBerry Z3. This is the first phone to be released under the terms of a five-year deal with contract manufacturer Foxconn. The later designs, produces and stores the phones, while BlackBerry brings its operating system and marketing prowess to the table. These are low-ends models designed for developing markets. The other two models are the top-shelf BlackBerry Passport and the BlackBerry Classic. Also, a slide listed the accomplishments of BlackBerry in the John Chen era. This includes having the messaging app BBM pre-installed on certain Android and Windows Phone models. Also noted was the shipping of the BlackBerry Z3, and the introduction of the BlackBerry Passport and BlackBerry Classic. You can check out the slides by clicking on the slideshow below! The problem with Nokia is that now they are in the hands of Microsoft and Microsoft steers their ship. Lets hope they keep the brand alive because Nokia was the alpha phone maker. He is actually on track to do just that.. 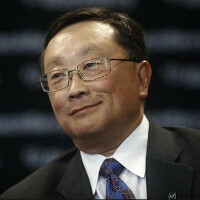 Wish him all the luck..
John Chen is definitely on track to making BlackBerry the force it once was. Only, it may be just more on the ENTERPRISE side of mobile, which is fine by me. As long as I can still get my hands on wonderful BB10 devices, I'm good. I don't BlackBerry just being a niche player in the consumer market, and a POWERHOUSE in the enterprise market. I wish you would accomplish closing your mouth! That's right. He's firing the employee & selling the real estate to ease the breaking out of bb. That is a thing of the past, yet you still think it's happening? You are delusional.